For valuable information and resources, please visit AIA’s Center for Emerging Professionals, the authoritative voice and resource for architecture students, recent graduates, and newly licensed architects. 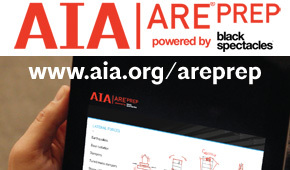 Associate AIA members are eligible to receive 15% off the regular price on the online video tutorial program. Choose either an annual or monthly subscription and watch the entertaining and informative videos on your own schedule, as many times as you want. ARE Prep has never been more effective or convenient!